Minnesota Vikings running back Latavius Murray is tackled by Philadelphia Eagles defensive tackle Fletcher Cox during the 2018 NFC Championship game at Lincoln Financial Field. 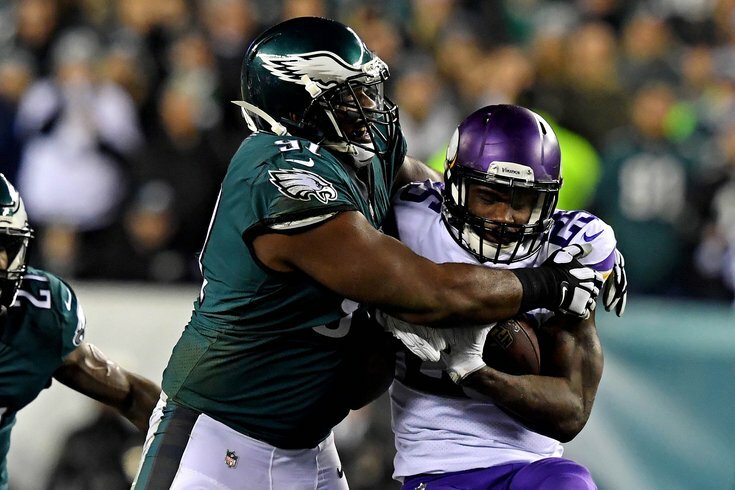 Coming into the 2018 season, Sunday's game between the Eagles and Vikings was one that stood out on the NFL calendar, not just because it was a rematch of last season's NFC Championship Game, a 38-7 victory for the Birds, but also because it was a potential preview of the 2019 title game. But a month into the season, things haven't quite gone according to plan for either team. The Eagles, who are 1-1 since Carson Wentz's return to action, are 2-2 on the season and haven't looked anything like the team that won the Super Bowl back in February. The Vikings, meanwhile, after making some offseason upgrades, specifically at quarterback, are just 1-2-1 after losing to the high-powered Rams last Thursday night and the lowly Bills a week earlier. Will the Eagles' recent home dominance over the Vikings — and home dominance in general — continue on Sunday? Here's how we see the game playing out. The Vikings are simply not the same defense without Everson Griffen rushing off the edge, and their offensive line remains an Achilles heel that the team failed to fix this offseason. The Eagles should be able to get pressure on "Kurt" Cousins and win in the trenches, assuming their star-studded offensive line can make adjustments after a shaky start, which I believe they'll do. This is good matchup for the Eagles. Plus, if you don't count the meaningless Week 17 game last year when the Eagles' JV lost to the Cowboys' varsity, the Eagles haven't lost at home since Week 14, 2016. That's 13 straight. So there's that. I have been god awful making predictions so take this with a multitude of grains of salt. The Eagles secondary has been awful, as has their offensive line. Those two units will be key against the Vikings - who at 1-2-1 are much worse thus far than many expected. I'll allow the Star Wars franchise to sum up my feelings about Sunday's Eagles-Vikings game. That being said, I have to lean toward the Eagles in this one for a couple of reasons. First, they've been utterly ridiculous at home for quite some time now and haven't lost a meaningful game there since Doug Pederson's first season. Second, Carson Wentz looked better last week than he did in Week 3, so I'm beginning to sense a trend there — and the Vikings defense hasn't been nearly as effective as last season (although the same can be said about the Eagles). Finally, as our own Jimmy Kempski has pointed out several times in the past, the Eagles have owned the Vikings' souls ever since that Sam Bradford trade over two years ago. There are caveats to each of my reasons, of course, like the fact that the rest of the Eagles' offense doesn't seem to be improving at the same rate as their quarterback — not to mention that Isaac Seumalo will reportedly get the start at left guard on Sunday. Or the fact that it will be noted Eagles killer Kurt Kirk Cousins and not Case Keenum under center for the Vikings. But I'm still going Birds. I will admit, I do not have the best feeling about this game. The Vikings come in with all of the same motivation the Eagles do to stop the bleeding, with the extra oomph of that NFC Championship game loss throwing more wood on that fire. They will come in ready to go to war, and the Eagles need to be prepared to match that. If the offense were firing on all cylinders, I would feel a little better about things, but Carson Wentz is being relied on far too heavily early in his return to play. He hasn’t been bad by any stretch, it’s just a lot to ask of any quarterback to come in and immediately carry the offense again. Doug Pederson needs to get back in a playcalling groove — we saw a lot of plays blown up in Philadelphia’s backfield before they could even get started last week in Tennessee. But while both the Eagles and Vikings were touted as major NFC threats all offseason (rightfully so), they’ve been decidedly between-the-20’s team so far this season. Both are below average at scoring right now — a decidedly important task in sports — and both the Eagles and Vikings rank near the top in red-zone defense, so the game may well hinge on which team can solve the other’s puzzle once they venture deep into enemy territory. So maybe I just refuse to predict victory for a team starting Kirk Cousins in a hostile environment. Actually, that’s exactly the reasoning behind this pick. You like that? This is a desperation game for both teams. I know the Vikings have revenge on their minds for the 38-7 pasting they took last season in the NFC championship. But the Vikings have shown they can't stop anyone. And with the Eagles at home, and Carson Wentz three weeks back, I see the Eagles offense opening even more.